I was praying for supernatural strength on the way to 360 Fitness Club this afternoon. Yup, you read that right. 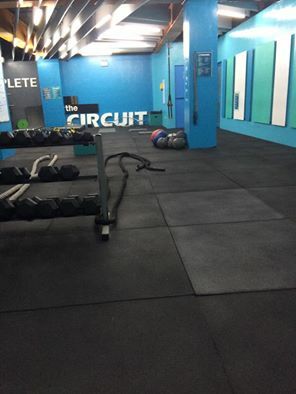 CIRCUIT TRAINING. After more than a year of not getting a regular exercise, circuit pa talaga ang napili ko! lol! Lakas ng loob, men! And just right after fasting too! But I followed the rules on the email sent -- get enough rest (I slept for 10 hours, thanks to the bed weather feels this morning), eat snacks 45 minutes before the training (can't go wrong with bananas) and I commuted going there so my body will get warmed up at the very least. So there I was, giving myself a pep talk an hour before --that whatever happens, I will go back. NO MATTER WHAT. I will commit to this. The turning point that made me realize that I had to do something with my body was a moment in front of the mirror. I usually stand in front of it just to see my outfit, or to put CC cream or eyebrow powder... I rarely sit in front of it... But lo and behold, that moment (maybe it was the Holy Spirit giving me that nudge), I sat in front of the mirror and what I saw surprised me -- hello tummy flab! It wasn't even the tiny cute flab that we could just cover up with a baggy top, it was FLAB, a huge chunk of it that seemed to sit comfortably on my waist... It has done a full 360 (yes naipasok ko pa!) and there's no mistaking that this is what my body looks like now. This realization was coupled with an immediate determination with the words: "YOU HAVE TO DO SOMETHING." So from Fitness Friday swimming program which we coined ourselves and failed to continue... I am committing myself to regular exercise for the rest of the year. Call this a mid year resolution but I'm definitely getting back on that horses named Fit and Flab-free. So if you're like me, and you can feel those pounds too and you have been meaning to do something about it, but your mouth just keeps on spurting excuses, now is the time do something about it. Whatever it is, you gotta do something about it. And here's the millennial advice: post in on your social media. I have posted mine in Instagram and Snapchat so there's no going back. People now know that I tried circuit training... So if I don't follow through, I will be the girl who was not disciplined and committed enough to finish what she started and I don't want to be like that girl. Gaspppp! So it's instant accountability! Win win, right! So commit, do something about it and post in on social media.